The beach at Silly Cay, Turks and Caicos. 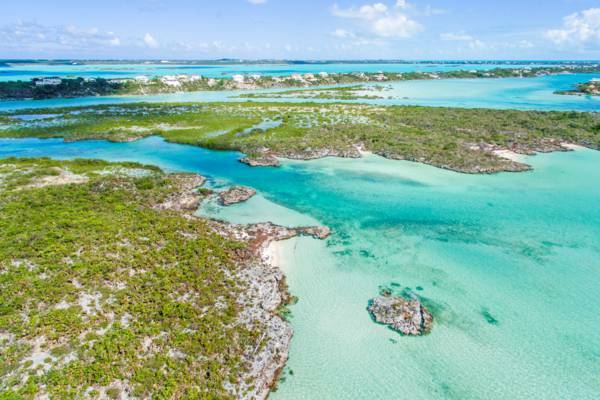 Located within the Chalk Sound National Park, Silly Cay is a small and uninhabited island that is found in the channel which connects the interior Chalk Sound lagoon and Silly Creek lagoon with the ocean and Caicos Banks. The channels and waterways here are a highly scenic kayaking and paddle boarding setting, and the small beaches on Silly Cay are a great place to stop at when in the area. The total landmass of the cay is about 40 acres (16 ha), yet much of the northern side of the island consists of mangrove wetlands and the remainder is generally of very low elevation, so dry ground is limited. Several small and scenic beaches are found interspersed between the low marine limestone ironshore cliffs of the south coast. 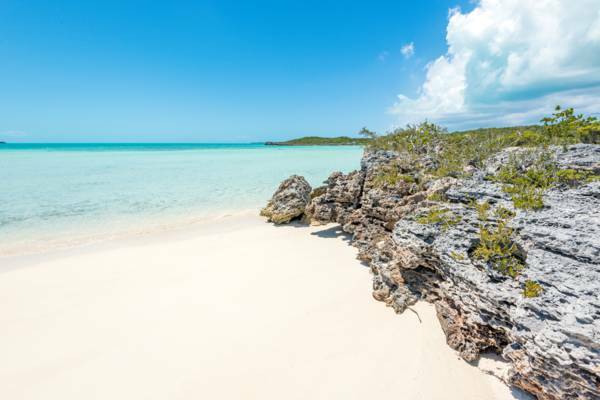 Due to their sheltered location on the Caicos Banks, the ocean at these beaches tends to be very shallow, yet the exquisite clarity and turquoise colour of the water maintains the quality found at other popular beaches on Providenciales such as Long Bay, Sapodilla Bay, and Taylor Bay. The highest elevations on the cay are located on the north coast, reaching heights of about 15 feet (4.5m). Mangrove wetlands make up the majority of this cay, a large percentage of which becomes submerged during unusually high spring tides. The channels surrounding Silly Cay are a haven for bird and marine wildlife. Green herons, yellow-crowned night herons and egrets can be seen in the mangroves, and juvenile lemon sharks and barracudas often hide in the deeper portions of the channels due to the plentiful prey. As is also the case with the surrounding regions of Chalk Sound and Silly Creek, the coastal dry forest of Silly Cay supports a rather high density of the poisonous coral sumac (Metopium toxiferum), which can cause severe skin rashes if touched. Silly Cay and Chalk Sound. The entire Chalk Sound region is a spectacular environment for exploring by kayak or paddle board. The defining feature of the area is the incredible turquoise water and the unique limestone ironshore coasts in the lagoon. Ironshore, unlike what its name suggests, doesn’t contain any iron, yet gets its name for the steely grey colour and intricately-weathered spikes and jagged edges that develop in sheltered areas. Tiny Karst process features are also very common. These marine limestone rock formations are very rare globally, and Chalk Sound is home to some of the best examples. The small islands in the area are quite scenic. It’s amazing how resilient and salt-resistant plant life can thrive on these hostile patches of rock. Likewise, many of the larger islands support populations of Turks and Caicos Rock Iguanas, which somehow survive in each isolated and minuscule island eco-system. Silly Cay was named after early 1900s Irish entrepreneur George Silly, a businessman who started an array of enterprises, including turtle farming, sea-sponge cultivation, and a seafood cannery. The nearby region of Silly Creek is likewise named after him, and is the home to many luxury vacation villas. Silly Cay is part of the Chalk Sound National Park, however, recent 2016 proposals may result in the removal of the cay from the protected area. Access is one of the potential limitations to development. Directly to the east is the expansive luxury mansion Emerald Cay, so the natural access from Silly Creek is prohibited. This leaves two other options: a long causeway or bridge across the protected sound and waterway, or a shorter bridge on the western side of the cay across West Mouth, a very long route that would mean extensive road development in the Frenchman’s Creek Nature Reserve.